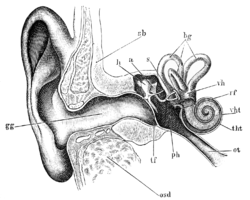 Schematic diagram of the human ear. Hearing, auditory perception, or audition is the ability to perceive sound by detecting vibrations, changes in the pressure of the surrounding medium through time, through an organ such as the ear. 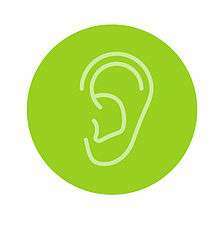 The middle ear consists of a small air-filled chamber that is located medial to the eardrum. Within this chamber are the three smallest bones in the body, known collectively as the ossicles which include the malleus, incus and stapes (sometimes referred to coloquially as the hammer, anvil and stirrup respectively). They aid in the transmission of the vibrations from the eardrum to the inner ear. While the middle ear may seem unnecessarily complex, the purpose of its unique construction is to overcome the impedance mismatch between air and water, by providing impedance matching. Also located in the middle ear are the stapedius and tensor tympani muscles which protect the hearing mechanism through a stiffening reflex. The stapes transmits sound waves to the inner ear through the oval window, a flexible membrane separating the air-filled middle ear from the fluid-filled inner ear. The round window, another flexible membrane, allows for the smooth displacement of the inner ear fluid caused by the entering sound waves. The hearing structures of many species have defense mechanisms against injury. For example, the muscles of the middle ear (e.g. the tensor tympani muscle) in many mammals contract reflexively in reaction to loud sounds which may otherwise injure the hearing ability of the organism. Hearing threshold and the ability to localize sound sources are reduced underwater, in which the speed of sound is faster than in air. Underwater hearing is by bone conduction, and localization of sound appears to depend on differences in amplitude detected by bone conduction. Aquatic animals such as fish, however, have a more specialized hearing apparatus that is effective underwater. Vertebrates aren't the only group of animals that have hearing. Some insects have hearing organs as well (e.g. the long-horned grasshopper, lubber grasshopper and the cicada); they use sound as a form of communication. Many mantises can even perceive ultrasound.. Some insects possess a tympanal organ. These are "eardrums", that cover air filled chambers on the legs. Similar to the hearing process with vertebrates, the eardrums react to sonar waves. Receptors that are placed on the inside translate the oscillation into electric signals and send them to the brain. ↑ Jan Schnupp; Israel Nelken; Andrew King (2011). Auditory Neuroscience. MIT Press. ISBN 0-262-11318-X. ↑ Kung C. (2005-08-04). "A possible unifying principle for mechanosensation". Nature. 436 (7051): 647–654. doi:10.1038/nature03896. PMID 16079835. ↑ Peng, AW. ; Salles, FT.; Pan, B.; Ricci, AJ. (2011). "Integrating the biophysical and molecular mechanisms of auditory hair cell mechanotransduction.". Nat Commun. 2: 523. doi:10.1038/ncomms1533. PMC 3418221 . PMID 22045002. ↑ Daniel Schacter; Daniel Gilbert; Daniel Wegner (2011). "Sensation and Perception". In Charles Linsmeiser. Psychology. Worth Publishers. pp. 158–159. ISBN 978-1-4292-3719-2. ↑ William Yost (2003). "Audition". In Alice F. Healy; Robert W. Proctor. Handbook of Psychology: Experimental psychology. John Wiley and Sons. p. 130. ISBN 978-0-471-39262-0. ↑ "Definition of hearing loss - hearing loss classification". hear-it.org. ↑ Martini A, Mazzoli M, Kimberling W (December 1997). "An introduction to the genetics of normal and defective hearing". Ann. N. Y. Acad. Sci. 830: 361–74. doi:10.1111/j.1749-6632.1997.tb51908.x. PMID 9616696. ↑ Vestergaard Knudsen, L.; Oberg, M.; Nielsen, C.; Naylor, G.; Kramer, S. E. (2010). "Factors Influencing Help Seeking, Hearing Aid Uptake, Hearing Aid Use and Satisfaction With Hearing Aids: A Review of the Literature". Trends in Amplification. 14 (3): 127–154. doi:10.1177/1084713810385712. ISSN 1084-7138. PMID 21109549. ↑ Graham, Michael (1941). "Sense of Hearing in Fishes". Nature. 147 (3738): 779. doi:10.1038/147779b0. ↑ "Frequency Range of Human Hearing". The Physics Factbook. ↑ Williams, C. B. (1941). "Sense of Hearing in Fishes". Nature. 147 (3731): 543–543. doi:10.1038/147543b0. ISSN 0028-0836. ↑ Deutsch, Diana (1999). The psychology of music. Gulf Professional Publishing. p. 153. ISBN 978-0-12-213565-1. Retrieved 24 May 2011. ↑ Hauser, Marc D. (1998). The evolution of communication. MIT Press. p. 190. ISBN 978-0-262-58155-4. Retrieved 24 May 2011. Peng, AW. ; Salles, FT.; Pan, B.; Ricci, AJ. (2011). "Integrating the biophysical and molecular mechanisms of auditory hair cell mechanotransduction.". Nat Commun. 2: 523. doi:10.1038/ncomms1533. PMC 3418221 . PMID 22045002.